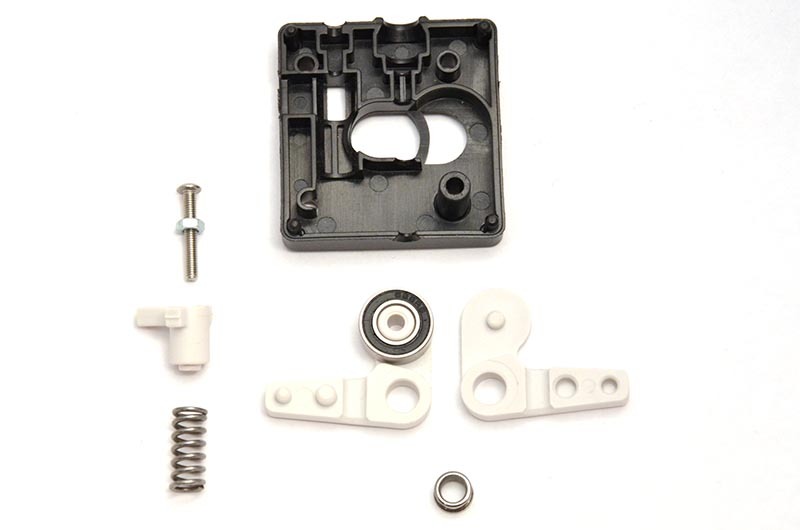 Disassembling your feeder isn't something that you will do often but there might come a time when it's necessary. 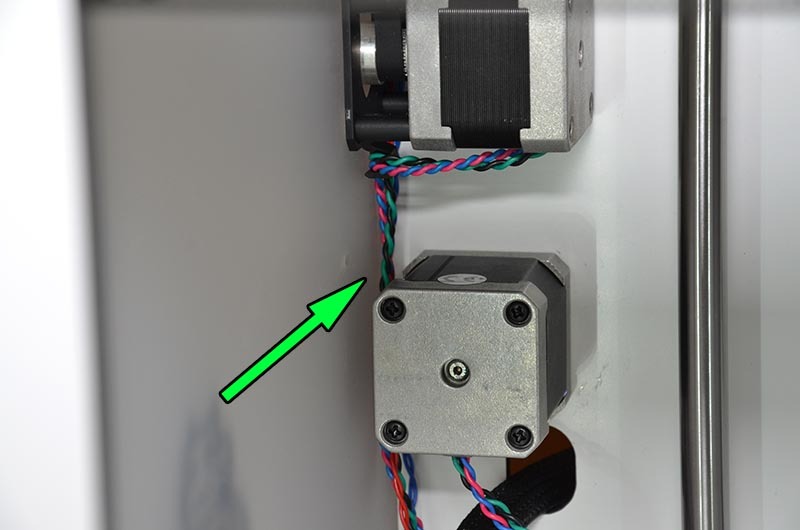 One such occasion could be if a piece of filament has become stuck inside the feeder or if you need to get better access to clean the knurled wheel. 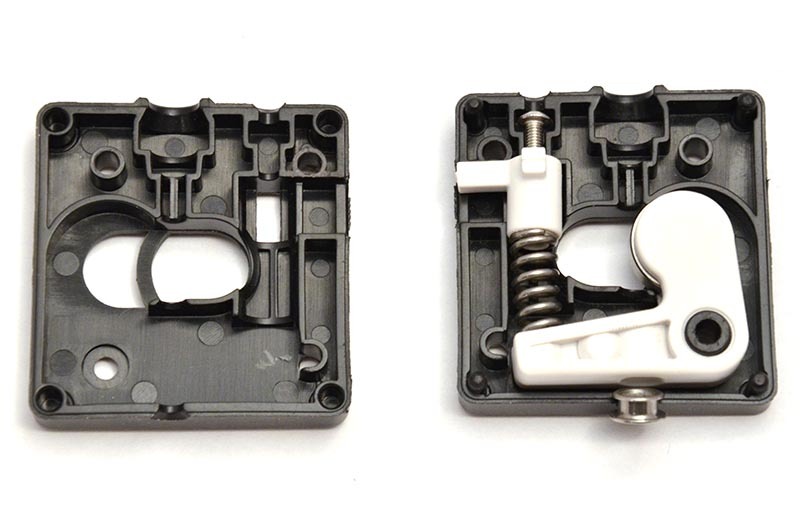 The prospect of taking such a vital part of your printer apart can be a bit scary but you'll see that it is far less scary than you might think. And don't worry, this will not void your warranty. 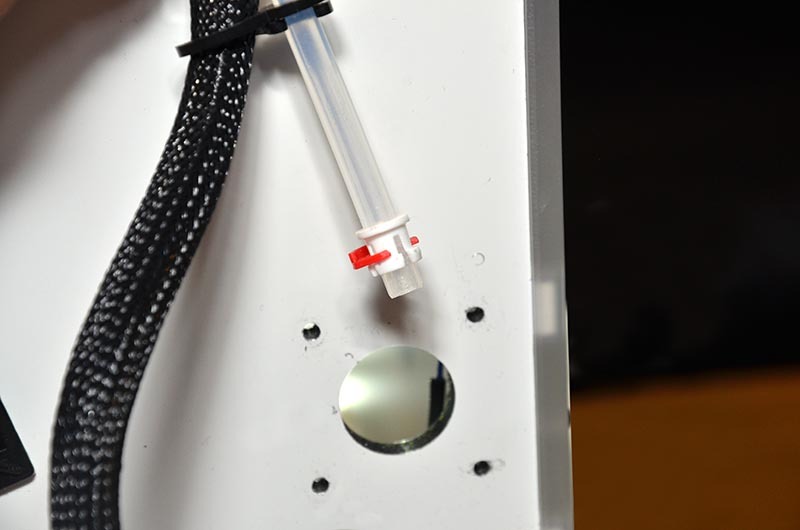 As you might have already figured out, the feeder is held in place with four screws. What you might not be aware of is that those same screws actually hold the feeder motor in place at the same time. 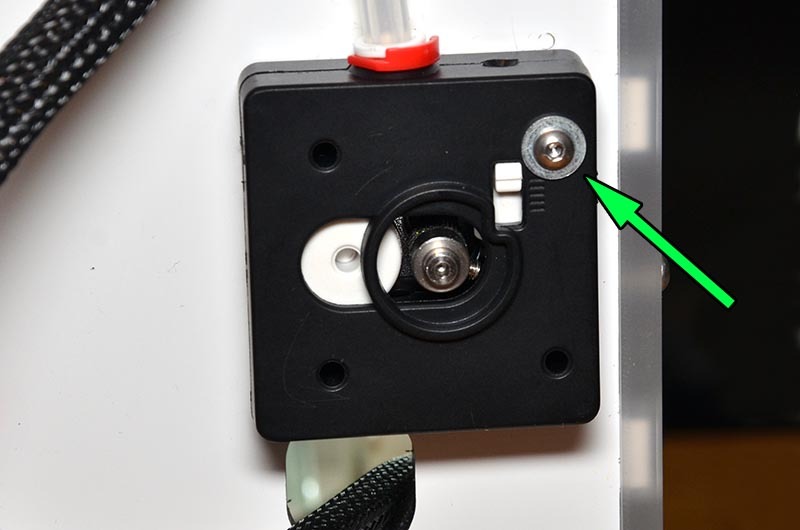 This is a problem in the sense that if you simply unscrew the feeder, the motor will drop. The stepper motor that drives the filament is hidden behind this panel, below one of the stepper motors that drive the head movement. 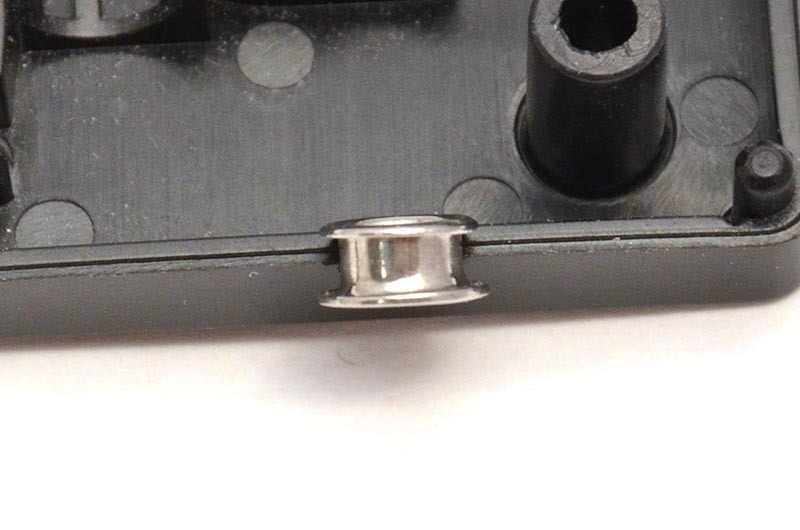 You remove this panel by removing the two screws that hold it in place and then lifting the panel out. Looking at the printer from the back there is one screw on the right panel and one screw at the back panel. Once the screws are removed you can simply lift the panel out. 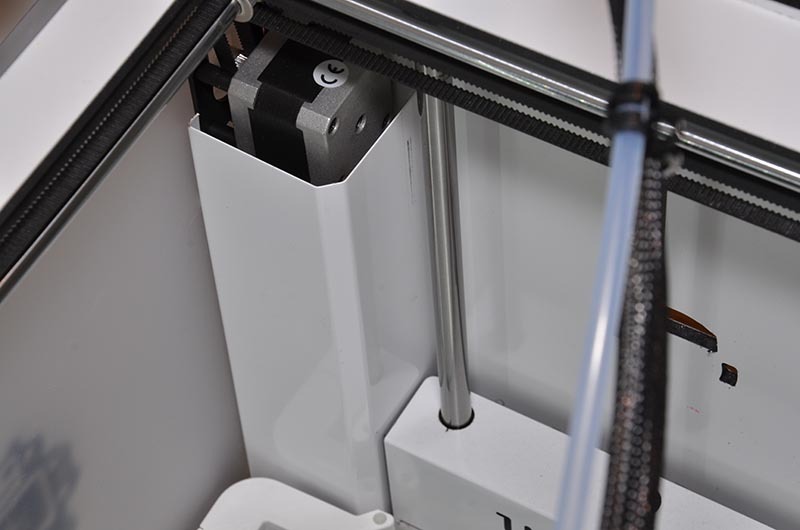 If it seems stuck it can help to tilt the panel slightly towards the front of the printer and wiggling it back and forth a bit. This is the motor that you need to catch. Proceed by removing three of the screws of the feeder motor. Before removing the last screw, hold the motor with your free hand and then set it down on the glass plate. As the feeder becomes freed the bowden tube will likely come loose on its own. This is fine, just let it hang. This is what the inside of your feeder looks like. Due to continued improvements on the feeder design there may be some slight differences compared to your own but the general design should be very similar. And here are the individual parts. The idler bearing can be removed as well but it can be stuck quite hard. Use a screwdriver and very carefully lever it out by inserting the screw driver between the arm and the bearing and prying carefully. Do this gradually on several places around the periphery or the bearing will be lifted out crooked and get stuck even more. To re-assemble you obviously do the steps again, in reverse. There's a couple of things to keep in mind. First, the metal grommet (if present) should be placed into the feeder so that the larger opening is towards the outside of the feeder. Second, the feeder can actually be mounted backwards if you're not paying attention. Make sure the pressure indicator is to the right. If not, your feeder will run in reverse. Also, when you put the motor back in place you need to make sure that the wires running in the corner of the printer do not get pinched. It's easy to miss and you might break the wires if you're unlucky. We've found that the easiest way to get the feeder mounted again is to do the following. First, put the white collet and bowden tube back in place and squeeze the feeder shut. 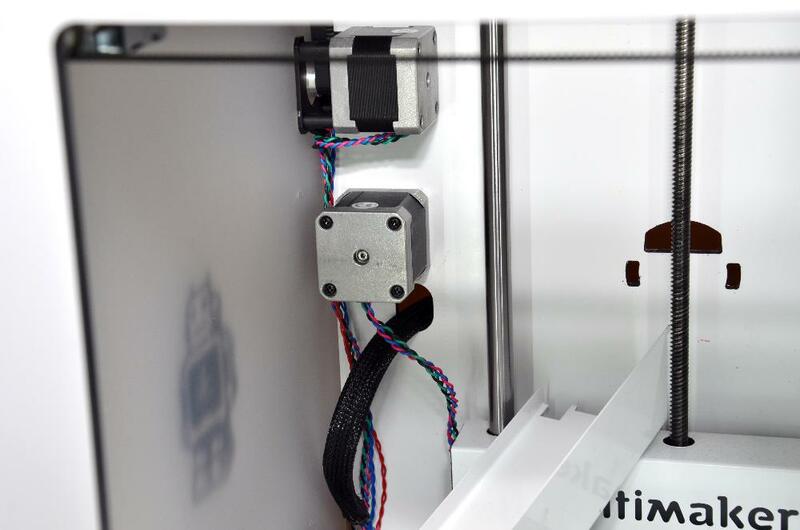 Put one screw through the feeder and then place it on the printer. The torque from the bowden tends to want to split the feeder apart and pop back out so keep pressure on the feeder the whole time. Next you'll need to free up one hand by placing your screw driver in place and pushing against the feeder to keep it shut and in place. With your other hand you can now lift the motor into position (remember the wires) and screw in the first screw. From here the rest is straight forward.